I’d like to believe that my mother always cooked for me, but the truth of the matter is that Sukumar was the king of the stove in our Calcutta kitchen. Tall, thin and hawk-like, Sukumar was our cook who made a monotonous yellow dal and “mixed” vegetables in a ubiquitous red sauce, day after day. He made a spinach sabzi too, and what I remember about spinach from those days is that it was a bitter, slimy, sometimes sandy vegetable, best avoided at all times. Fast forward twenty years, I find myself sitting in a man’s home, eating a creamy palak paneer made with poppy seeds and lovingly fried cubes of paneer. I find myself exchanging shy glances with the cook behind this creation, and in the end here we are six years later, married with two children. That spinach paneer recipe is nowhere to be found, so I’ve had to come up with my own. What has taken me some time to understand is that a richly aromatic palak paneer dish tastes best — meaning plenty of ginger, garlic and onion along with one or two green chillies for spice, since spinach has a very mild flavor. You can add extra spinach here for a more saucy dish, but in that case add more onions, ginger and garlic. The amount of paneer to put is really up to you – add more or less depending on the balance that you like. I like blanching the spinach to preserve its bright green color. 1. Set water to boil in a big pot, and add the washed spinach when it comes to boil. Cut off the spinach roots, but use all the leaves and stems. Boil for about 5-7 minutes, until the spinach is soft but is still bright green. Drain, save some of the boiled water, and run the spinach under cold water. 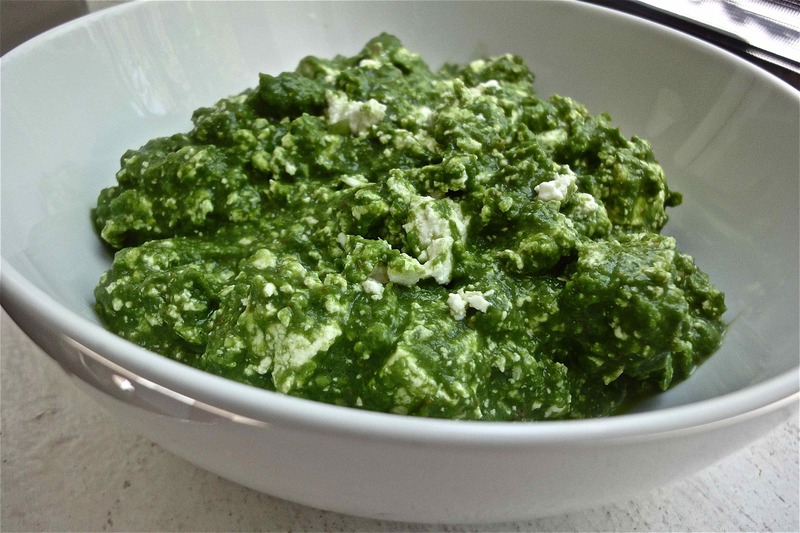 Puree the spinach in a food processor or blender with some of the reserved water about a 1/2 cup. Set aside. Note, you can also NOT puree the spinach leaves, but drain and keep aside as is. 2. Heat the oil in a large pan. Add the cumin seeds when the oil is hot. Next, add the green chillies and onions and cook until the onions turn golden. Add the ginger and garlic and sauté for a few more seconds. 3. Add the pureed or whole cooked spinach and cook for a minute. Add the coriander powder, garam masala and salt and cook for 2-3 minutes. Remove from the flame. 4. Blend the spinach mixture in a food processor or with an immersion blender. Meanwhile, separately fry the half cup of chopped onions and kasuri methi in a little butter until the onions are soft. Add blended spinach and the pieces of paneer. Cook for a few minutes and serve. Sounds delicious! I am going to try it this weekend. Thank you so much for the great recipe. I made it and it was delicious. Texture is very smooth and taste is settle- just the way I like it. I was a little afraid to start making this dish because I have only made Indian food a couple of times before, but your steps were super easy to follow. I was thinking of a variation, without pureeing the spinach and just chopping it roughly along with all the masala. Thought that would be an earthy, more rustic spin on it – especially if you are using homemade paneer. What do you think?